To Lanjarón in search of a damn fine cup of coffee – and we found it. Having lived in London where the choice of coffee establishments – from the old, formica-tabled cafés of Soho to the muffins and chrome of Costa – can be overwhelming, here it’s easier to plonk yourself down with a cortado and not think much of it anymore. In Spain, like Italy, it’s hard to get a bad coffee. The memory of drinking a morning gallon of milky bilge water – what were we thinking of – is fading fast. Indeed, having a mug of coffee doesn’t happen anymore; instead it’s a glass, barely larger than a thimble, of strong coffee. A few sips and it’s ‘be still my beating heart’ – so time for another then, and perhaps a nibble of something from the Russian roulette that is the pastry and cake display (S swears that Spanish bakeries can’t make proper croissants – ‘they don’t use butter‘). 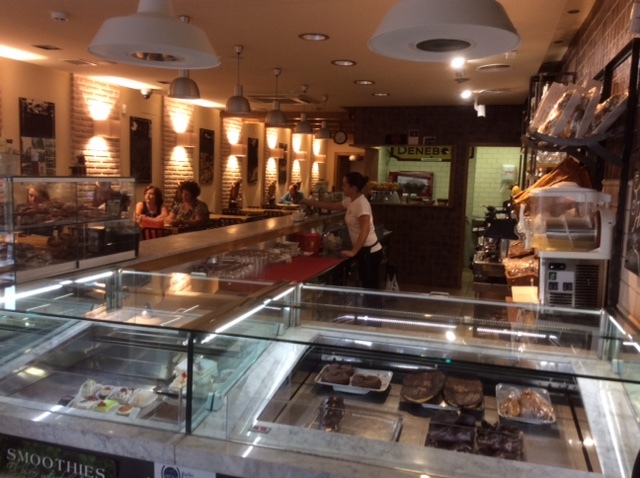 Cafetería Denebola in Lanjarón is the nearest place we’ve found to those shiny, modern places in Granada – and the best coffee. The staff are fabulous, the prices decent, it has the best loos in town and…well, seek it out, it’s worth it in our opinion. We love the dark, decades-old cafes too, but sometimes a bit of nice lighting and a fine display of ice cream does the trick. It’s on the main street which, like dental floss, divides Lanjarón’s toothy grin of white buildings. Here are two pictures not featuring a cafe solo or cortado. * For anyone interested, our favourite place for a coffee in London is Notes near Trafalgar Square, and of the big brands, Caffè Nero. agreed, recently discovered it – and the cakes looked alright too! Hi Carol – did you stumble upon it (like we did)? 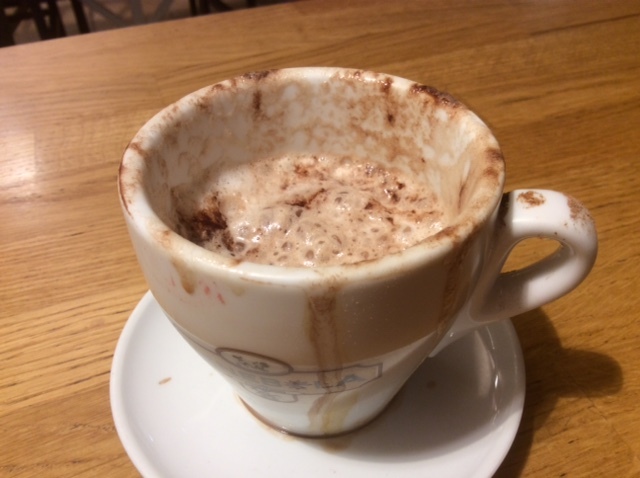 The hot chocolate is great if you haven’t tried it.